As an avid Benefit lover, I watched this product be released in the US with a mix of jealousy and excitment. Just the kind of product I love, I was a little envious that the US gets all these awesome products before we do down under. So when a press release landed in my inbox detailing the magic properties of this product and its launch date in Australia, I requested a sample right away.I'm very pleased to report back that this product delivers on everything it promises and is completely glamourous looking to boot! 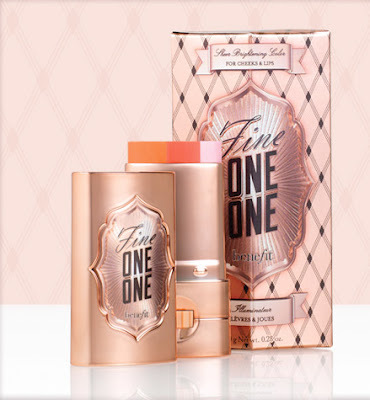 A dual purpose cosmetic (which I LOVE), Fine-One-One is an all in one blusher, contour and highlighter.Featuring soft coral, watermelon and pink champagne shades that, when lightly blended in a circular motion, provide the perfect balance for your cheecks. Get that accidentally-just-flashed-your-knickers-Gil-Elvgren-style flush and glow with just one swipe! Holding the product at a right angle with the champagne shade facing up, simply glide a stroke of shade from the apple of cheek to your temple then lightly blend upwards in a circular motion. The cream to powder formula also means that it glides on easily and seamlessly transitions to the softest, powder-like finish with real staying power. Go from day to night, just add another swipe! Small enough to carry around in your handbag and with a sheer enough coverage to offer more control, you can build the drama to suit your look and easily go from office to party time just by adding another swipe and blend of product.Pretty in pink pin up perfection in one sheer pop! Better yet (and here's where the DUAL purpose comes in) you can also use this on your lips for a subtle pretty pout. After applying the pigment to your lips, dot the champagne shade in the centre of your lip, top and bottom to plump that pout. The stunning packaging made me fall instantly in love and the beautiful romantic pink metallic case is utterly glamourous while the little wind up function makes it super easy to use and ensures you won't waste any product. With the added benefit of two products for the price of one and it's amazing results for very little effort, this product is a total winner in my opinion. I haven't come to expect anything else of Benefit to be honest but this little pocket rocket is a must for every gals make up arsenal. and pick up this beauty for instant lift, shape and pop!